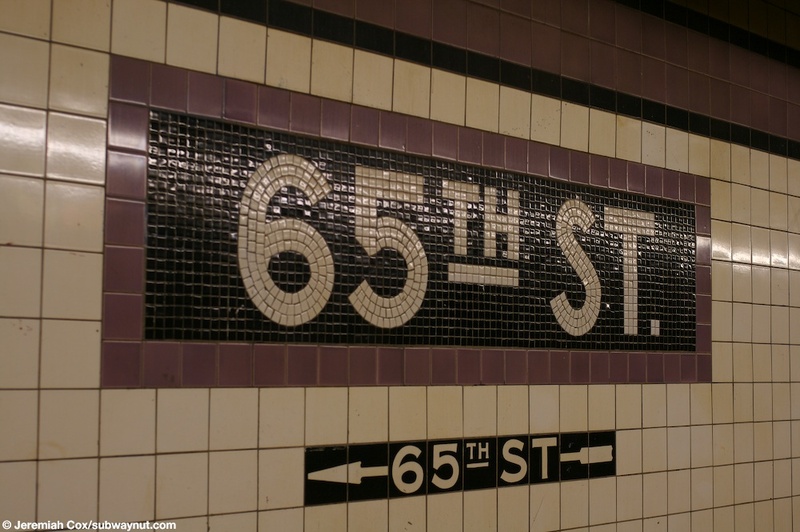 65th Street is an usual Queens Blvd Line Station. 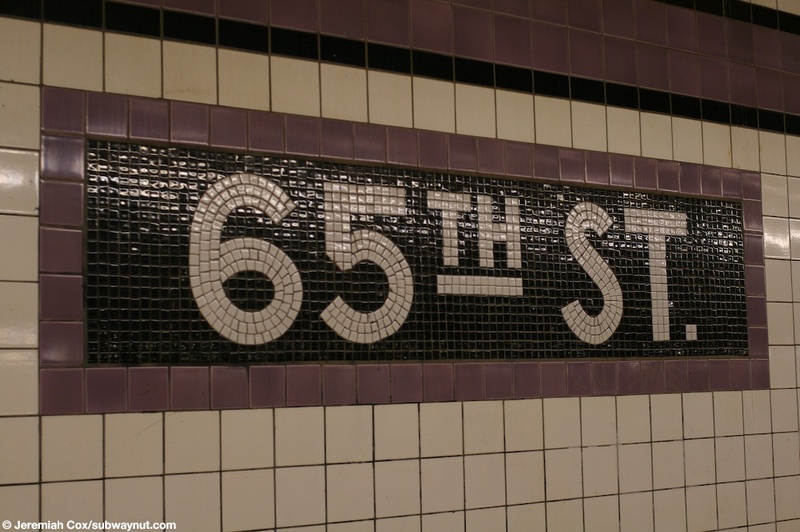 The only entrance & exit that's currently open is on the eastern end of the platform at 65th Street/Rowan Street & Broadway. 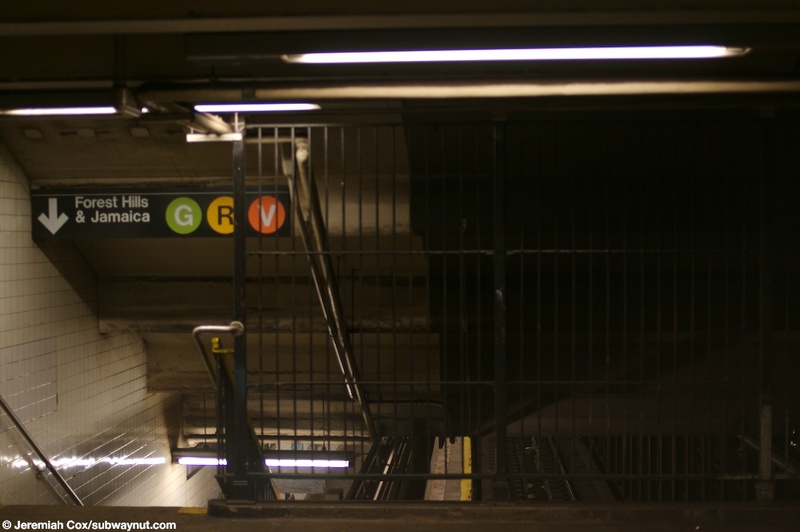 It is accessed by a relatively small mezzanine that only exists on the eastern end of the platform that has three staircases down to each platform, each of the these staircases still has its original mosaics, for the Manhattan-bound platform they say Manhattan and Brooklyn. Going farther towards Queens they say Jamaica and Rockaway! Yes Rockaway as in Far Rockaway. This destination mosaic is a relic of the ambitious but never built IND Second system that was going to have a branch off the Queens Blvd line down the LIRR Rockaway Branch. 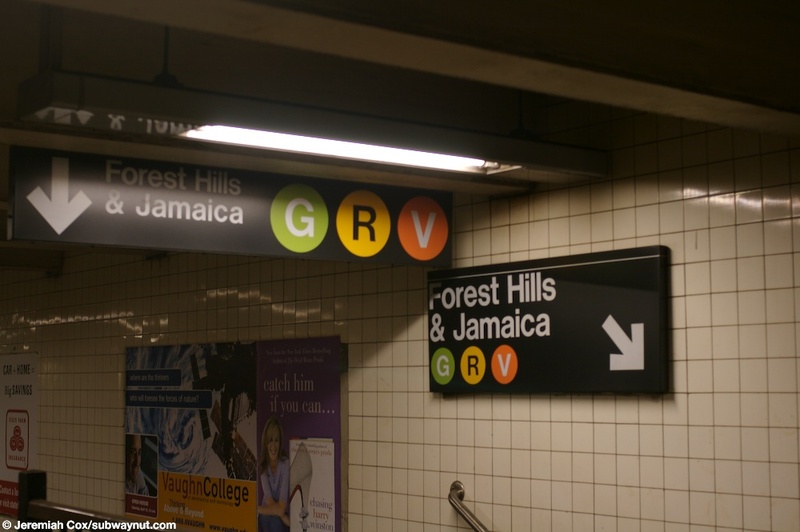 Two of the staircases have generic Forest Hills & Jamaica signs on the walls fitted over the Rockaway sing, one though still is exposed, the Forest Hills & Jamaica sign has probably fallen off or removed by a nostalgic vandal, exposing the old sign. 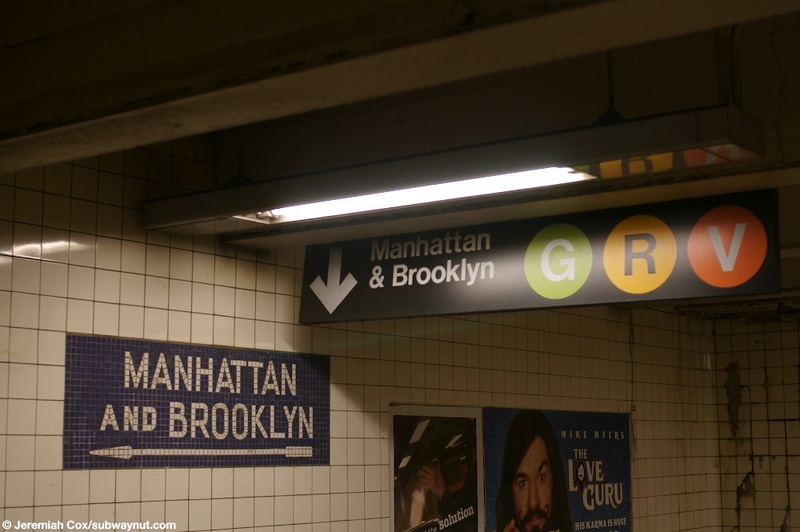 There is evidence on each platform of a regular side platform entrance/exit that used to exist at the other end and directional signs still direct to it underneath some of the name tablets. 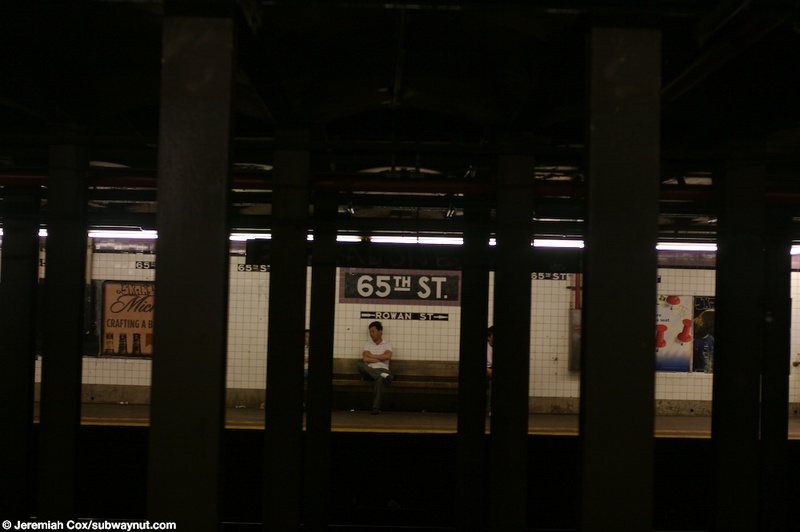 It was to 63rd Street on the Forest Hills-bound platform and to 35th Ave on the Manhattan-bound platform. 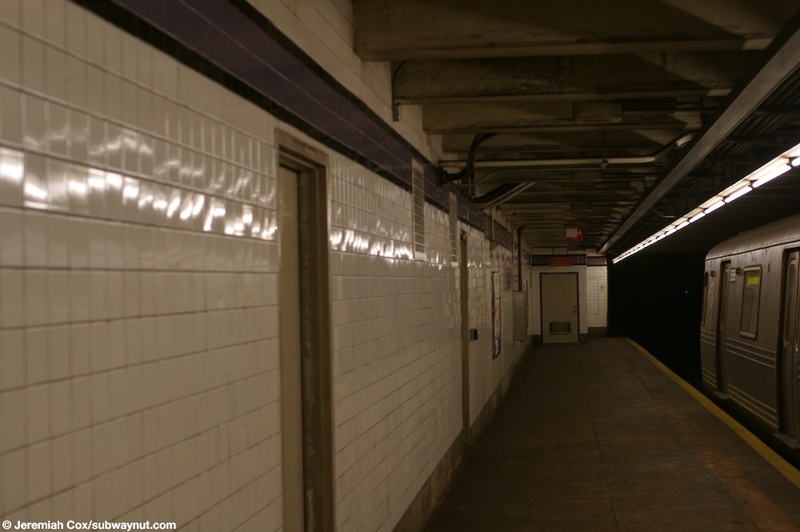 Also to note for the station is that there are no columns along the platforms, just the purple trim and purple border around the name tablets. 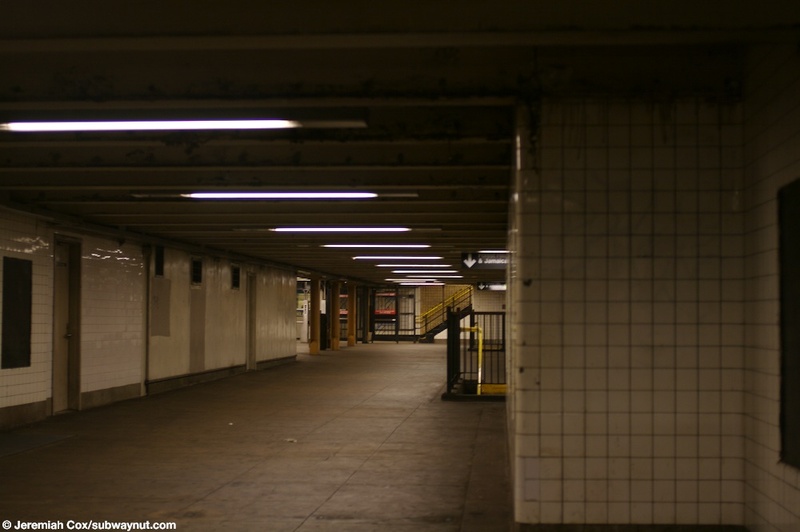 On the small mezzanine the columns are painted yellow. 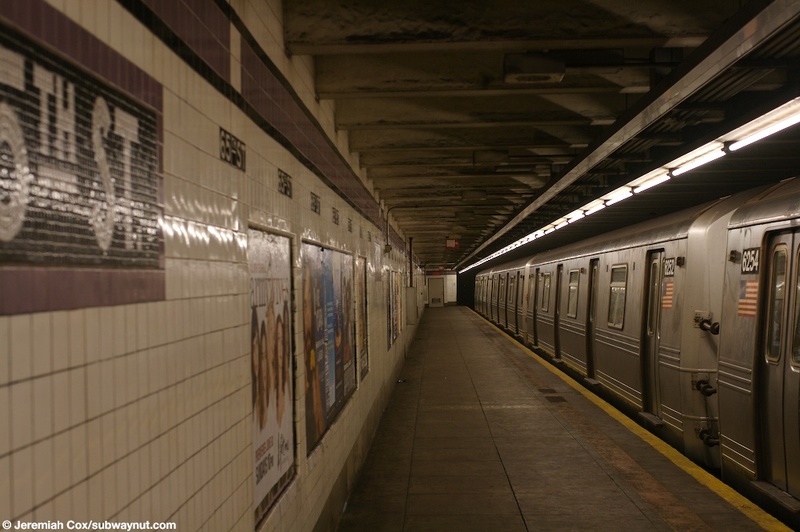 (65r1) Looking down the Forest Hills-bound platform at 65th St with a R46 R train about to leave the station. 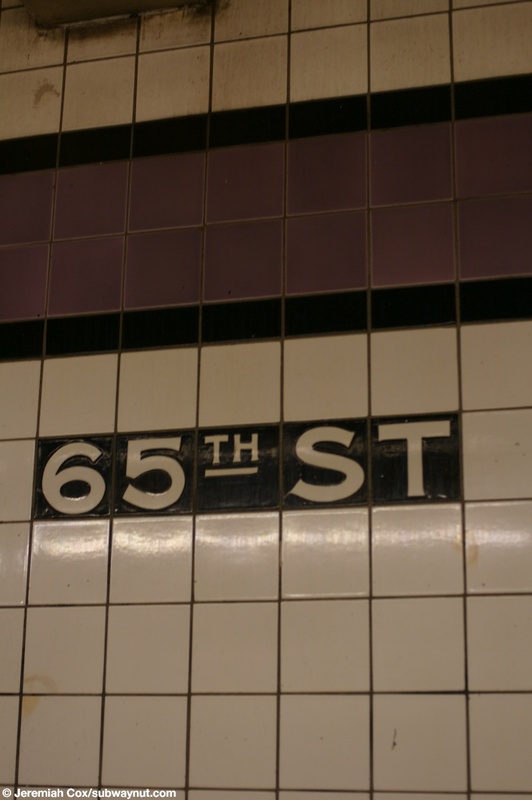 5 June, 2008 (65r2) 65th St tiled text underneath the purple line with a black border that forms the trim. 5 June, 2008 (65r3) A name tablet at 65th St that has no sign for an exit underneath it. 5 June, 2008 (65r4) A name tablet at 65th St with text for the no longer in existence exit at 63rd St underneath it. 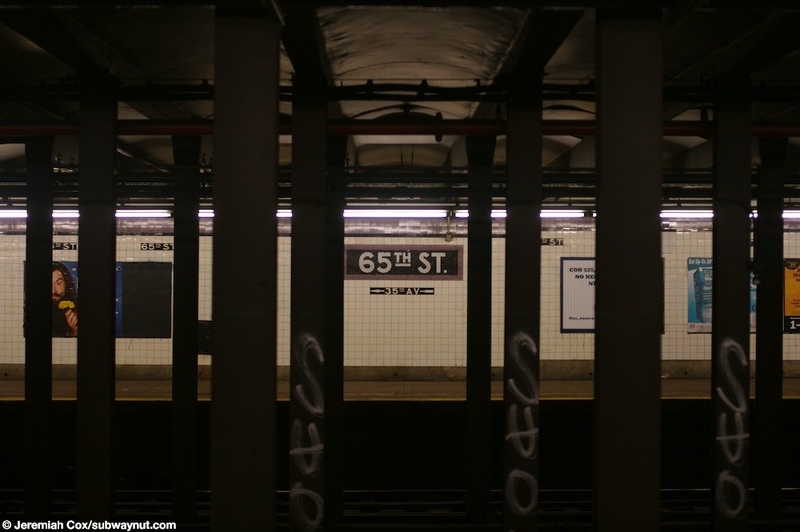 (65r5) Where a on the side platform exit used to be to 63rd Street at 65th Street on the Manhattan-bound platform, its a long area of the platform with a couple of doors and only the trim and no name tablets, a tell tale sign of an abandoned exit. 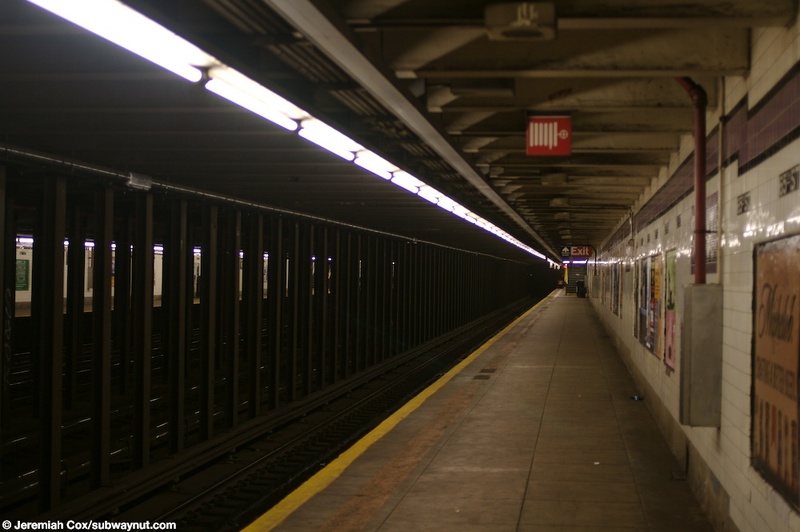 5 June, 2008 (65r6) Looking across to the Manhattan-bound platform at 65th St with a name tablet visible, it has underneath it text for an exit that no longer exists at 35th Ave.
5 June, 2008 (65r7) Looking down the cololumless Forest Hills-bound platform with the staircase up to the exit on a small mezzanine visible. 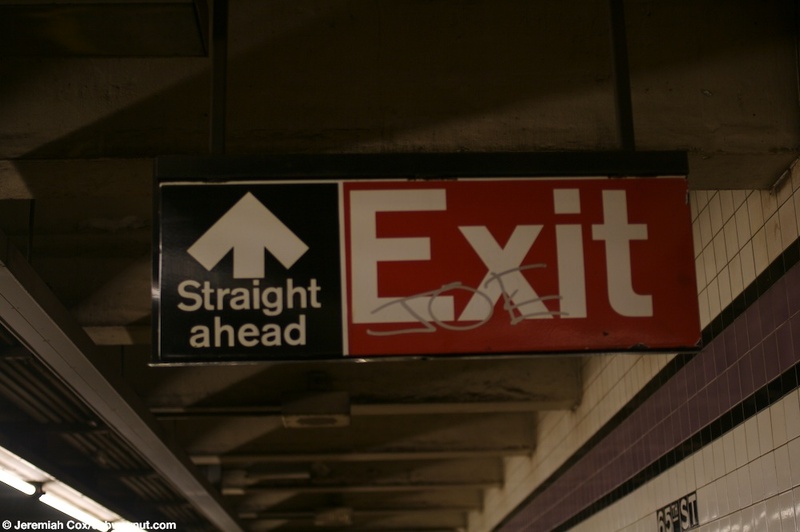 5 June, 2008 (65r8) An older exit sign at 65th Street with the Straight Ahead text visible underneath the arrow. 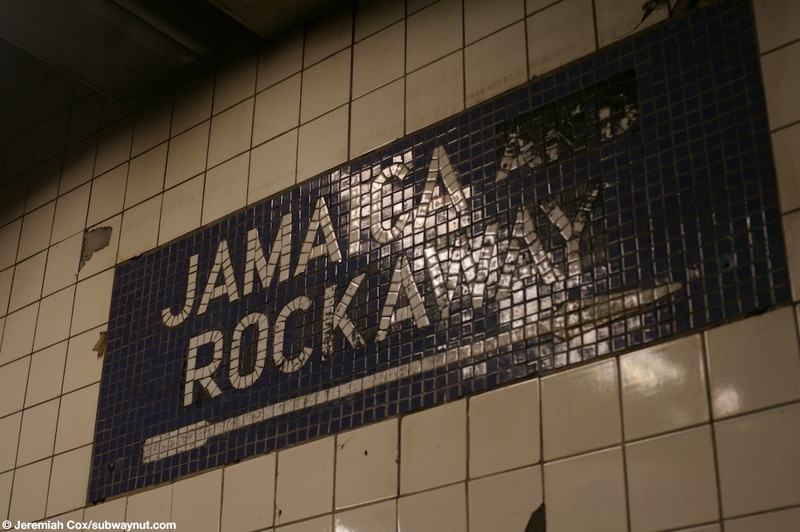 (65r9) A sign for Jamaica and Rockaway along the mezzanine wall, its a true relic of the never realized and overly ambitious plans the city had for the IND Subway System it was building. 5 June, 2008 (65r10) Another view down the quite small mezzanine at 65th Street, it is split by various rooms. 5 June, 2008 (65r11) A staircase down to the Forest Hills & Jamaica platform at the end of the small mezzanine at 65 Street, the Forest Hills-bound local track is visible in the picture has the roof gradually slopes down just beyond the fence at the end of the mezzanine. 5 June, 2008 (65r12) A view of another staircase down to the Forest Hills & Jamaica platform, the sign on the wall that seems unnecessary do to the sign hanging from the ceiling is there to cover up the old Jamaica & Rockaway Mosaic. 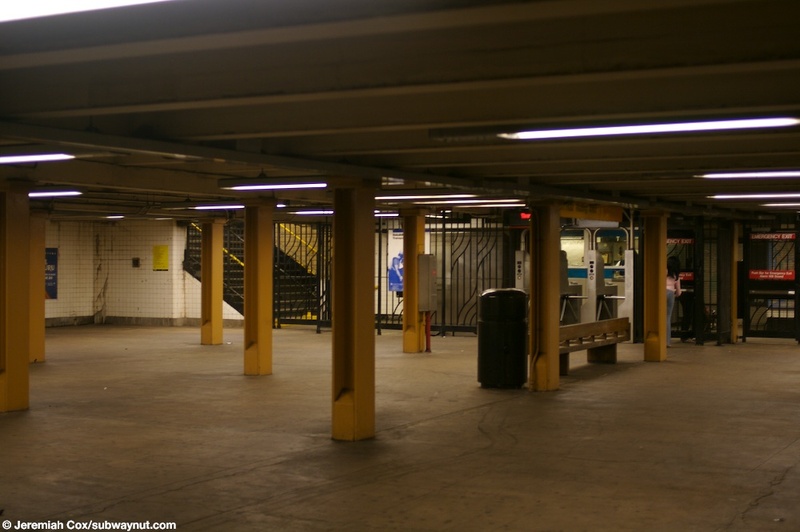 (65r13) The small mezzanine at 65 Street where fare control is, it has yellow painted columns. 5 June, 2008 (65r14) A Manhattan & Brooklyn mosaic in the same font as the Jamaica & Rockaway one, all of these are still visible since they are accurate. 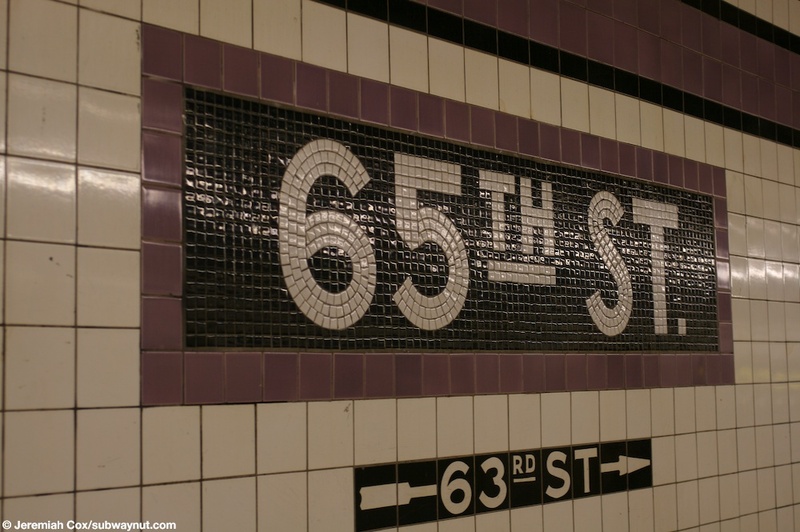 5 June, 2008 (65r15) A name tablet at 65th St with the exit directional text pointing towards 65th St underneath it.